Colleagues of the trapped workers wait for news outside the mine near Zonguldak. Istanbul, Turkey (CNN) -- Rescuers have found the bodies of 28 workers buried in a coal mine, authorities said Thursday, dimming hopes for two more missing days after an explosion rocked the facility in northern Turkey. The miners were trapped Monday after a mysterious explosion rocked the sprawling state-owned coal mine near the Black Sea port of Zonguldak. Hundreds of rescue workers scrambled to cut through fallen rubble to reach the victims trapped in a shaft 540 meters underground. Energy Minister Taner Yildiz said crews were still searching for the two remaining victims. "We believe they died from carbon monoxide poisoning when the accident happened, but we are not sure yet," Yildiz said in a live appearance on Turkish television. Relatives of the victims have been holding a vigil in a tent near the entrance to the coal mine. Turkish President Abdullah Gul issued a statement on his web site Wednesday calling for an investigation into the cause of the explosion. "Our president instructed the State Inspection Council to start research and investigation into the accidents that happened in te mining sector during the recent period that caused casualties and injuries, and deeply affected the public," the statement said. The accident devastated a community that relied on nearly minimum-wage mining jobs to make ends meet. "This is a mining town with a mining tradition," Taci Alkaya, the head of the mine worker's union in Zonguldak, told CNN by phone. "Families always have more than one miner in a household. Often the jobs pass from father to son." 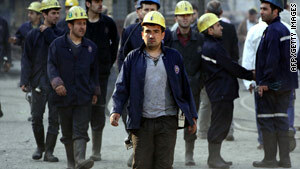 Alkaya said the mine in question worked 24 hours a day, with three to four alternating shifts. He added that the 28 miners likely earned between 800 Turkish lira ($550) and 1000 Turkish lira ($684) a month. Though the facility is state-owned, the miners killed were working for a private company contracted to fulfill a specific job in the mine. Turkish labor unions have denounced the practice of hiring private contractors, questioning their safety standards. "The practice of contracting jobs to private companies in state-owned mines should be stopped immediately," said a statement from the secretary general of DISK, one of Turkey's largest federations of labor unions, in the wake of the Zonguldak disaster. This is the third major accident to shake Turkey's mining industry in 6 months. Nineteen miners died in a methane gas explosion in the western province of Bursa in December. 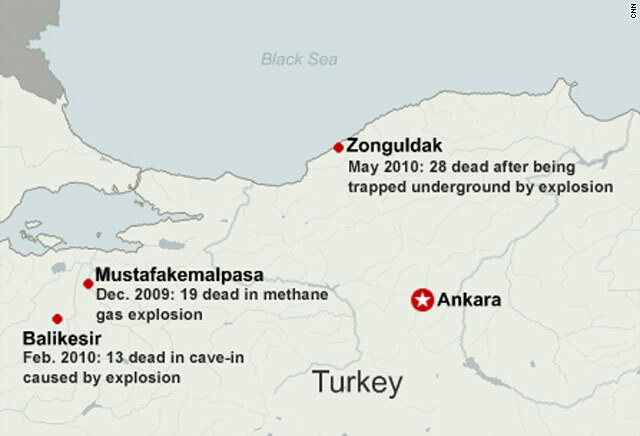 In February, 13 miners died after a similar explosion hit a mine in Balikesir.